About ten years ago, while I was still working, a retired teacher who regularly visited our office came by with some bags of 'sewing things.' She was nearly 90 at the time and her daughter was insisting that she sell the family farm and move into smaller quarters in town. Among the items she was giving away to any and all takers were two Norman Rockwell Christmas panels, which I happily accepted. These vintage panels are much larger than those produced currently, measuring 35 inches by over 57 inches from selvedge to selvedge! They were marked only "Wamsutta" and "Hallmark Cards." I would love to know when they were produced but so far Google has revealed nothing. 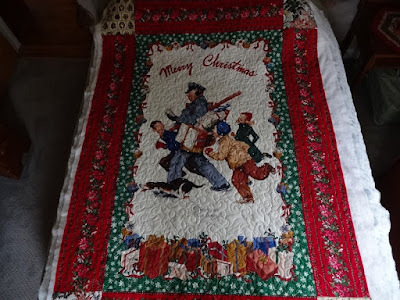 Anyway, right from the time I received them I had planned to make Christmas quilts for my son and daughter's families. This is the year that will hopefully become a reality! 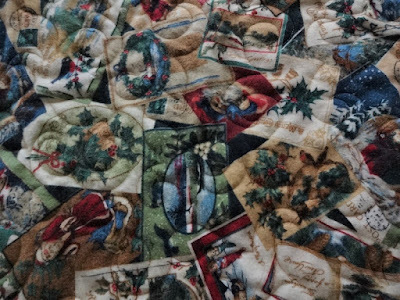 So last week I found my bin of Christmas fabrics and went to work to add some borders and make the quilts a little larger than just panels, found a perfect backing fabric from among the flannels and set about quilting them. Here is the first one, quilting complete and just needing binding attached along with a bunch of threads to tie off and bury. It was dark and gloomy when these photos were taken, in the one above the red border is more true to color than the left. This first quilt top measured 73 x 51-1/2 inches before quilting. And I'm loving this wonderful Thimbleberries flannel backing from 2006 - 6 whole yards sitting in the bottom of the bin, and just exactly enough to back both quilts! It's so soft and plush, I know the grands will be fighting over who gets to wrap up in this quilt - good thing it's long enough to go over all three if they snuggle up on the couch! The second one, for my daughter's family, is well on the way, being about 75% quilted at this point. It has a predominantly green border and different print cornerstones, but otherwise is very similar to this first one. 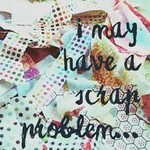 I'll be taking a break from quilting for a few days as the first cataract surgery is scheduled for tomorrow morning. Hoping that the stitching hiatus is short-lived, cause I'm on a Christmas gift-making roll now and don't want to stop! The panel is so cute! I have never seen anything like it. It/They will make for perfect Christmas snuggling! First, good luck and prayers for tomorrow. You will be back to quilting really soon. This panel turned quilt is wonderful! I never had that print but had similar ones by Wamsutta---local company here in SC--in the late 80s. 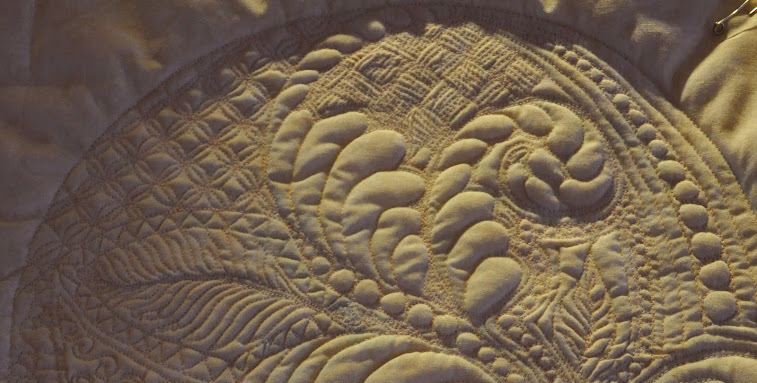 Your quilting on this is just perfect to create that great texture. And with flannel on the back it is a great winter snuggle quilt. Good luck with your surgery. 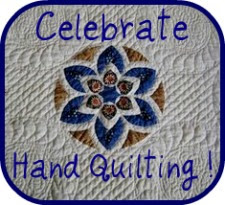 Hoping you get back to quilting FAST! 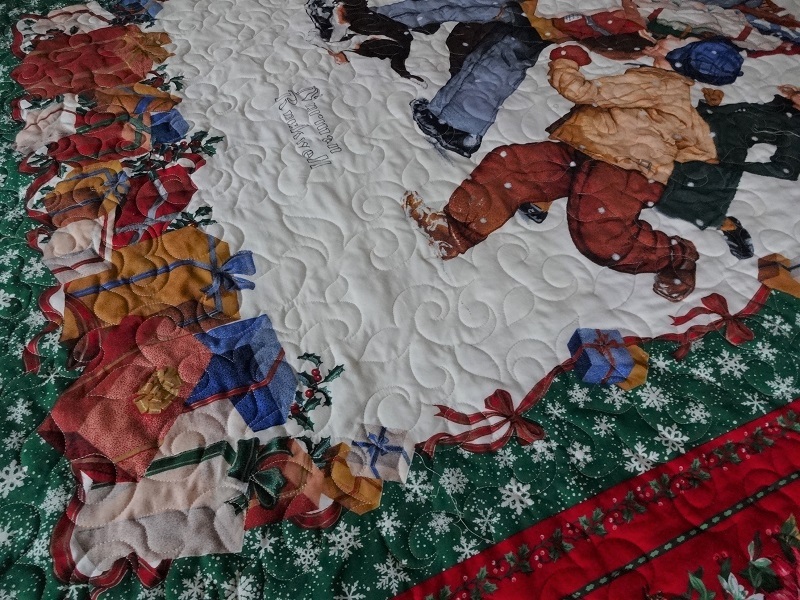 Love the quilt panel. I love the quilting that you have done. I'll bet it feels heavenly too. I love flannel backed quilts. Good luck with the surgery. They say the world is so much brighter after surgery. Hi! I hope your eye surgery went well. Sending healing thoughts. I didn't find any more info for your quilt panels, except they are often called door panels when they are very large. I guess they went on folks' front doors sometimes? And quite a lot of NR items were featured by Hallmark in the late 1980's, perhaps an anniversary of? and your quilt panels may date from then. Beautiful gifts! Let us know how you are! 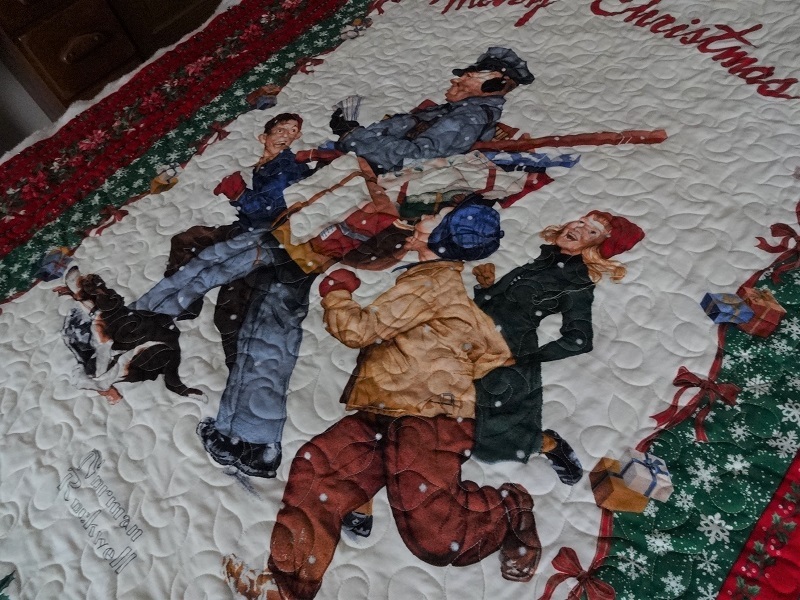 Having just recently visited the Norman Rockwell museum and studio, I am especially drawn to these fun quilts. The bordering is beautiful, and you did find the perfect backing! Did I fail to mention my hope that all went well with your surgery? Saying a prayer for you with your surgery and quick healing. November OMG "Sajou" is a Finish!